Excite some electrons as you construct circuits during this electrifying class! Test various materials for conductivity while experimenting with plasma balls. Recreate the process of rock formation, and devise ways to identify and classify rocks and minerals. This hands-on class really rocks! Students will devise and test oil spill techniques in a mock oil spill, and learn all about the polution that plagues the ocean. 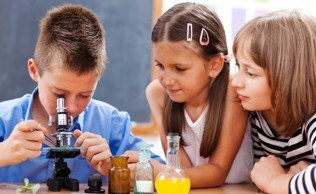 Investigate the ingredients of the universe - atoms, molecules, elements, and compounds! Student will build molecules, and mix chemicals as they discuss physical and chemical changes and the three states of matter. This workshop provides an introduction to the chemical processes in a plant, plant respiration, and the role of plants in food webs. Students will discuss different types of plants, their leaves and the products they produce. Students will learn about the interconnections that exist between all living things in an ecosystem, including humans. The nature cycles, food chains, and energy webs within different environments are explored.